This beautiful old-fashioned nursery has been at this location for more than 60 years. Sherman and Emilie Payne, founders of our company, helped establish this site. Today it is home to our large tree and shrub yard as well as a tropical greenhouse with an extensive selection of houseplants — some we grow, others we ship in from warmer climates, including Florida, California and Texas. We have many more greenhouses that we use to grow perennials and annuals, including poinsettias and Easter lilies. We offer the largest selection of fruit trees in Northern New Mexico and stock more large shade trees than any other retail nursery in New Mexico. We also offer exotic and regional conifers, shrubs, vines, perennials and ornamental grasses. The Paynes family built this nursery and greenhouse in the mid-1970s and we’ve been serving customers here ever since. This location has a larger interior space than our North Store, and a smaller yard for trees and shrubs. There is a tropical greenhouse attached to the main building and two large greenhouses at the back of the yard. Just like at the North Store, the South Store grows perennials and annuals, including substantial crops of poinsettias and Easter lilies. 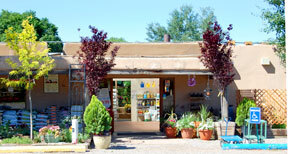 Payne’s Organic Soil Yard has the best selection of organic mulches, soil amendments, and soils in Northern New Mexico. Bring your truck or we’ll deliver. Click here to go to the POSY page on this website.